The Holy Apostle Philip was a native of the city of Bethsaida (or Bethesda, in Galilee). He had a profound depth of knowledge of the Holy Scripture, and rightly discerning the meaning of the Old Testament prophecies, he awaited the coming of the Messias. Through the summoning of the Saviour (Jn. 1:43), Philip followed Him. The Apostle Philip is spoken about several times in the Holy Gospel: he brought to Christ the Apostle Nathanael (Jn. 1:46); the Lord asks him how much money would be needful to buy bread for five thousand men (Jn. 6:5-7); he brought certain of the Hellenised Jews wanting to see Jesus (Jn. 12:21-22); and finally, at the time of the Last Supper he asked Christ about God the Father (Jn. 14:8). After the Ascension of the Lord, the Apostle Philip preached the Word of God in Galilee, accompanying his preaching with miracles. Thus he restored to life a dead infant in the arms of its mother. From Galilee he set off to Greece, and preached amongst the Jews that had settled there. Certain of them reported in Jerusalem about the preaching of the apostle, in response to which there arrived in Hellas (Greece) from Jerusalem scribes with the Jewish high priest at their head, for a persecution against the Apostle Philip. The Apostle Philip exposed the lie of the high priest, who said that the disciples of Christ had stolen away and hidden the body of Christ, telling instead how the Pharisees had bribed the soldiers on watch to deliberately spread this rumour. When the Jewish high priest and his companions began to insult the Lord and lunged at the Apostle Philip, they suddenly were struck blind. By prayer the apostle restored everyone to sight, and in beholding this miracle, many believed in Christ. The Apostle Philip established a bishop for them, by the name of Narcissos (listed within the rank of the Seventy Disciples). From Azota the Apostle Philip set out to Syrian Hieropolis where, stirred up by the Pharisees, the Jews burned the house of Heros, who had taken in the Apostle Philip, and they wanted to kill the apostle. But in witnessing miracles wrought by the apostle – the healing of the hand of the city official Aristarchos, withered in attempting to strike the apostle, and also a dead lad restored to life – they repented and many accepted holy Baptism. Having made Heros bishop at Hieropolis, the Apostle Philip went on to Syria, Asia Minor, Lydia, Emessa, and everywhere preaching the Gospel and undergoing sufferings. Both he and his sister Mariamna accompanying him were pelted with stones, locked up in prison, and thrown out of villages. Then the Apostle Philip arrived in Phrygia, in the city of Phrygian Hieropolis, where there were many pagan temples, among which was a pagan temple devoted to snake worship, having within it an enormous serpent. The Apostle Philip by the power of prayer killed the serpent and healed many bitten by the snakes. Among those healed was the wife of the city governor Amphypatos. 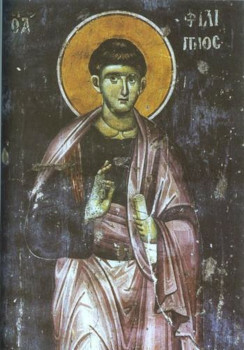 Having learned that his wife had accepted Christianity, the governor Amphypatos gave orders to arrest Saint Philip, his sister, and the Apostle Bartholomew travelling with them. At the urging of the pagan priests of the temple of the serpent, Amphypatos gave orders to crucify the holy Apostles Philip and Bartholomew. At this time there began an earthquake, and it knocked down to the ground all those present at the judgement place. Hanging upon the cross at the pagan temple of the serpent, the Apostle Philip prayed for the salvation of those that had crucified him, to save them from the ravages of the earthquake. Seeing this happen, the people believed in Christ and began to demand that the apostles be taken down from the crosses. The Apostle Bartholomew, in being taken down from the cross was still alive, and he baptised all those believing and established a bishop for them. But the Apostle Philip, through whose prayers everyone remained alive, except for Amphypatos and the pagan priests, died on the cross. Mariamna his sister buried his body, and together with the Apostle Bartholomew she set out preaching to Armenia, where the Apostle Bartholomew was crucified; Mariamna herself then preached until her own death at Likaoneia (Comm. 17 February).